Need help? More information on General Information Signs Life is much simpler when things are clearly signposted. It’s easy to become confused when visiting somewhere new, for little tasks to slip our minds when busy, or to forget the risks we expose ourselves to at work. Taking advantage of our range of General Information Signs ensures that everyone who sets foot in your premises can easily locate and understand information to keep themselves safe. Suitable for use in a wide range of businesses and other locations, our selection of signs comes in a variety of sizes, types and materials – see our guide to sign materials for more information. General Information Signs are used to communicate important or useful information and messages to members of the public, those who work on the premises or to those visiting the property. These types of signs help keep people protected from hazards or risks and advising them on the steps they should take to avoid the risk of injury. Due to their expansive use, these signs can also be used to indicate which bins to use, which spaces to park in, directions to take, and to show visitors where reception or other notable areas of the business are. The messages displayed on these signs cover a huge range of topics, including parking restrictions, no ball games, age limitations or signs regarding the use of tobacco products or the consumption of alcohol. But should you struggle to find the exact message to meet your needs, we can help you create your own signage. Our unique online Creator tool will enable you to create a sign that is unique to you and your business. Use handrail signs will keep people safe on staircases or escalators, entrance and exit signs give customers and employees clear guidelines on how/where to enter and leave the premises or car park; and no pets allowed signs send a clear message regarding general rules to be followed on your site. Other signs, such as private parking, provide people with simple instructions when it comes to picking a parking space, and please ring for attention signage can be used for a multitude of different purposes on site. Waste and recycling areas can also benefit from the inclusion of some of our General Information Signs – food waste only signs, hazardous waste must be stored separately and paper and card only signs help ensure that your company’s waste disposal meets environmental guidelines. Disabled facilities and access signs are also very important to install, since on-site accessibility is another huge aspect to consider when picking out signage. General Information Signage acts as a helping hand for visitors and employees alike, and can work really effectively when displayed in the optimum position. Affixing your new signage is easy – browse our selection of sign fixings to find the best product for your needs. 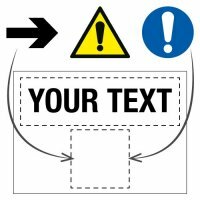 Ensure that your staff and visitors can safely navigate their way around your premises by choosing from the expansive range of General Information Signs. Whether you choose from our range or would prefer to create your own signage, you can rest assured that our wide range of affordable, durable products is fully compliant with all UK and European health and safety regulations and will stand the test of time.